One of the first things that most Microsoft Word users learn is how to change the formatting of their fonts using the Font section of the ribbon, such as making things bold, italics, underline, using different font faces, and different sizes. While learning these techniques, allows a beginner to quickly be able to make a document that has their fonts look the way they want, it also hinders amateurs from becoming professionals, because by using the Font section for all formatting, instead of just ad-hoc formatting, users develop bad habits. 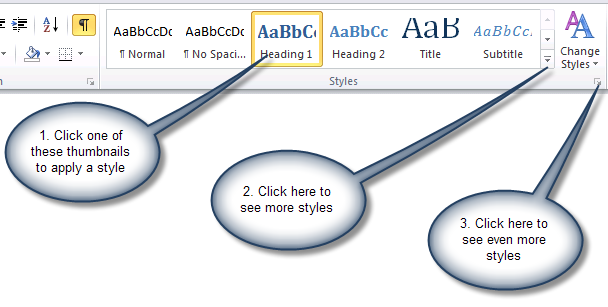 Styles quickly helps all formatting to be consistent in a document. By using “Heading 1” for the start of every chapter of a book, or part of a report, all the headings will still be consistent. Styles allow you to quickly change all your formatting. If you used Heading 1 to set the font for all of your chapter titles, or report section headings, then by changing the Heading 1 style in the style Ribbon, all of the titles will change at one time. This is the same for using the “Normal” style, you can have all your normal text change at one time. Check out the Microsoft Support article about how to customize or create new styles in Word, to see how to do this. Styles are not only about fonts, but they also are a form of meta-data about your document, that facilitate a lot of other Microsoft Word features. For example, by using Heading 1, Heading 2, etc. for chapter titles, or sections of a report, these headings will automatically be shown in the navigation pane, making it very easy to quickly jump to different parts of your document. Further, by using headings, you can make a Table of Contents quickly and easily, in a way that can easily be updated. Without using the Heading styles, making a Table of Contents is more time consuming, and takes a lot more work to ensure it is accurate. Check out the article “The Wicked Easy Way to Create a Table of Contents in Word” from LinkedIn Learning, to see how to do this. So how else do you think Styles can help you? Tomorrow, we will talk about the three levels of attributes that Microsoft Word has: Character, Paragraph, and Section, and why professionals understand these levels well, and how that mental model helps them to quickly know what tools to use in Microsoft Word for what type of formatting.